A virus is a tiny parasite which can infect living organisms. It is made only of a nucleic acid + a protein coat. Usually the nucleic acid is RNA; sometimes it is DNA. Their method is to get their nucleic acid strand into a prokaryote or eukaryote cell. The (usually) RNA strand then takes over the cell machinery to reproduce itself and the protein coat. The cell then bursts open, spreading the virus. All viruses act in this way, and there are no free-living viruses. Viruses are ubiquitous (everywhere), and all organisms suffer their attacks. Some specialised viruses are worth noting. Bacteriophages have evolved to enter bacterial cells, which have a different type of cell wall from eukaryote cell membranes. 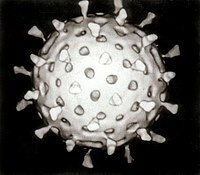 Envelope viruses, when they reproduce, cover themselves with a modified form of the host cell membrane, thus gaining an outer lipid layer that helps entry. Some of our most difficult-to-combat viruses, like influenza and HIV, use this method. Viral infections in animals provoke an immune response that usually eliminates the infecting virus. Immune responses can also be produced by vaccines, which confer an artificially acquired immunity to the specific viral infection. However, some viruses including those causing AIDS and viral hepatitis evade these immune responses and result in chronic infections. Antibiotics have no effect on viruses, but several antiviral drugs have been developed. Virus replication cycle: 1-Attachment, 2-Penetration, 3-Uncoating, 4-Synthesis (4a-Transcription, 4b-Translation, 4c-Genome replication), 5-Assembly, 6-Release. Replication of viruses involves multiplication of the genome. This usually requires synthesis of viral messenger RNA (mRNA) from "early" genes. This may be followed, for complex viruses with larger genomes, by one or more further rounds of mRNA synthesis: "late" gene expression is of structural or virion proteins. A group of large viruses infect amoebae. The largest is Pithovirus. Others in order of size are Pandoravirus, then Megavirus, then Mimivirus. They are bigger than some bacteria, and visible under a light microscope..
↑ 3.0 3.1 Breitbart M, Rohwer F (2005). "Here a virus, there a virus, everywhere the same virus?". Trends Microbiol 13 (6): 278–84. doi:10.1016/j.tim.2005.04.003 . PMID 15936660 . ↑ Lawrence CM, Menon S, Eilers BJ, et al. (2009). "Structural and functional studies of archaeal viruses". J. Biol. Chem. 284 (19): 12599–603. doi:10.1074/jbc.R800078200 . PMC 2675988 . PMID 19158076 . ↑ Edwards RA, Rohwer F (2005). "Viral metagenomics". Nat. Rev. Microbiol. 3 (6): 504–10. doi:10.1038/nrmicro1163 . PMID 15886693 . ↑ Barman S, Ali A, Hui EK, Adhikary L, Nayak DP (2001). "Transport of viral proteins to the apical membranes and interaction of matrix protein with glycoproteins in the assembly of influenza viruses". Virus Res. 77 (1): 61–9. doi:10.1016/S0168-1702(01)00266-0 . PMID 11451488 . ↑ Staginnus C, Richert-Pöggeler KR (2006). "Endogenous pararetroviruses: two-faced travelers in the plant genome". Trends in Plant Science 11 (10): 485–91. doi:10.1016/j.tplants.2006.08.008 . PMID 16949329 . ↑ Alberts et al., Bruce (2002). Molecular biology of the cell; 4th ed. New York and London: Garland Science. ISBN 0-8153-3218-1 . http://www.ncbi.nlm.nih.gov/books/bv.fcgi?call=bv.View..ShowTOC&rid=mboc4.TOC&depth=2. Retrieved 15 September 2008. ↑ Ding SW, Voinnet O (2007). "Antiviral immunity directed by small RNAs". Cell 130 (3): 413–26. doi:10.1016/j.cell.2007.07.039 . PMC 2703654 . PMID 17693253 . ↑ Patton JT, Vasquez-Del Carpio R, Spencer E (2004). "Replication and transcription of the rotavirus genome". Curr. Pharm. Des. 10 (30): 3769–77. doi:10.2174/1381612043382620 . PMID 15579070 . ↑ Jayaram H, Estes MK, Prasad BV (2004). "Emerging themes in rotavirus cell entry, genome organization, transcription and replication". Virus Res. 101 (1): 67–81. doi:10.1016/j.virusres.2003.12.007 . PMID 15010218 . ↑ Le Page C, Génin P, Baines MG, Hiscott J (2000). "Interferon activation and innate immunity". Rev Immunogenet 2 (3): 374–86. PMID 11256746 . ↑ Greer S, Alexander GJ (1995). "Viral serology and detection". Baillieres Clin. Gastroenterol. 9 (4): 689–721. doi:10.1016/0950-3528(95)90057-8 . PMID 8903801 . ↑ Matter L, Kogelschatz K, Germann D (1997). "Serum levels of rubella virus antibodies indicating immunity: response to vaccination of subjects with low or undetectable antibody concentrations". J. Infect. Dis. 175 (4): 749–55. doi:10.1086/513967 . PMID 9086126 . ↑ Cascalho M, Platt JL (2007). "Novel functions of B cells". Crit. Rev. Immunol. 27 (2): 141–51. PMID 17725500 . ↑ Hilleman MR (2004). "Strategies and mechanisms for host and pathogen survival in acute and persistent viral infections". Proc. Natl. Acad. Sci. U.S.A. 101 Suppl 2: 14560–6. doi:10.1073/pnas.0404758101 . PMC 521982 . PMID 15297608 . ↑ Matsuzaki S. et al. (2005). "Bacteriophage therapy: a revitalized therapy against bacterial infectious diseases". J. Infect. Chemother. 11 (5): 211–9. doi:10.1007/s10156-005-0408-9 . PMID 16258815 . This page was last changed on 11 September 2014, at 13:06.